The British Chamber of Commerce of the Philippines (BCCP) held its year-end Press Conference and Media Appreciation Luncheon held at the Dusit Thani Manila in Makati City last December 11, 2018. Invited media heard from no less than BCCP Executive Chairman Chris Nelson about what BCCP has been doing to support the communities in various activities and work hand in hand with the government for the growth and development in the Philippines. Since the inception of the Overseas Partner Delivery (OPD) Project in April 2014, the British Chamber of Commerce (BCCP) has assisted 2,000 British companies and the services offered include contact referrals, market introduction, market research and Trade Mission. To date, there are a total of 54 British companies have been assisted by the Chamber through the Business Support Service (BSS). The sectors represented by BCCP’s clients come from various industries like Food & Beverage, Retail, ICT, Construction, Healthcare, and Business Consultancy among others. Currently, the Chamber is assisting several UK clients from different sectors which include Education & Training, Electronics, Logistics and Software. BCCP has helped British companies successfully do business in the Philippines, including Pizza Express (retail), Linn Products Ltd. (audio equipment) and Verder UK (industrial pumps). Other assisted companies are still in the process of negotiating agreements with local companies. 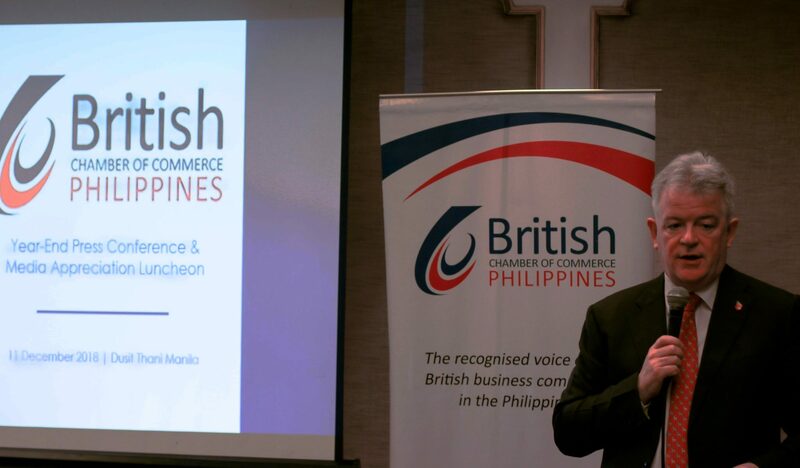 These were the successful activities done under the tutelage of British Chamber of Commerce of the Philippines such as Trade Mission to Iloilo (March 8-9, 2018), Philippine Economic Briefing and BCCP Event held last September 25-27, and Britain in Southeast Asia (BiSEA) Roadshow in the UK which was held on April 30 to May 11, 2018 and October 15-26, 2018. The BCCP has actively demonstrated its support to the government’s 10-point socioeconomic plan, particularly in promoting regional investment which was tackled in March Trade Mission in Iloilo wherein 150 delegates making it the biggest Trade Mission organised by the Chamber. Then from September 25-27, 2018, BCCP has also been active in supporting the Philippine government’s efforts in promoting investment opportunities, in particular, infrastructure development. This was done through the Philippine Economic Briefing and BCCP Event with DTI Secretary Lopez in London, United Kingdom which was attended by 250 business leaders from leading UK companies. The briefing was followed by a roundtable discussion with DTI Secretary Ramon Lopez, which was attended by 20 companies interested to know more about the business landscape in the Philippines. This roundtable discussion was jointly organised by BCCP and UK-ASEAN Business Council (UK-ABC). On April 30 to May 11, 2018 and October 15-26, 2018, there was Britain in Southeast Asia (BiSEA) Roadshow in the UK. This came into being to further promote export and investment opportunities in the Philippines. Thus, BCCP Chairman Chris Nelson attended these two Britain in Southeast Asia (BiSEA) Roadshows in the United Kingdom. He met with 165 British companies with business interests in the region, representing a wide range of sectors – including Education and Training, Food & Beverage, Retail, ICT, Logistics and Healthcare. The Chamber has been continually assisting these companies; many with great export potential into the Philippines. For 2019, according to BCCP Executive Chairman, it is going to be another exciting year for the British Chamber of Commerce of the Philippines as they have a lot of activities like Trade Mission in 2019 in various areas in the Philippines. On the sideline, BCCP Executive Chairman Chris Nelson explained to the media when ask about the extent of investment of UK to the Philippines. Primarily, the UK companies are SME and not yet looking at PEZA or Economic Zones. He also shared what the effort that the BCCP is doing to entice more investors from the United Kingdom to look at the Philippines as a investment hub. But the BCCP Chief said that Philippines is not the immediate market for UK companies Europe being just next door is in the top of the mind of the companies in the UK. However, the BCCP especially the Executive Chairman Nelson has been educating them about the Philippines’ economic performance and other advantages in investing to the Philippines like the main language of communication in business and legislation is in English and also the ease of doing business in the Philippines. The BCCP Year-End Press Conference and Media Appreciation Luncheon was attended by local and international media, and also by representatives from the British Embassy Manila Cecille Fontanilla, Press and Communications Lead and Jon Perez, Prosperity Officer, Policy, Projects and Communications.